There is nothing that is more significant in any relationship than strong, open communication, especially for those on a team. Of course, the more people who are involved, the more chances there are for misunderstandings. Teams should try to break down barriers that interfere with the team. This is not always the easiest thing to do. Many barriers tend to crop up more than once, causing difficulties in a team. Here are the top ten most common team barriers and how to overcome them. 1. Self-esteem and not feeling like they add any value to the team. If a team member bases their self-esteem on other’s perceptions of them, it will influence how that team member responds to the team, especially if the feedback is negative. To overcome: There are a host of ways to bring up self-esteem. Engage in self-talk, positively visualize yourself, avoid comparing yourself to others, and let go of the past. Try to tell yourself you will add value to the team and then visualize a way you can do that. Do not compare what you add to the team to someone else on the team. Each person plays different roles and will add different values. Try not to fixate on a negative experience. Think about what you add to the team in this experience instead. 2. Non-verbal skills are not right for the situation. 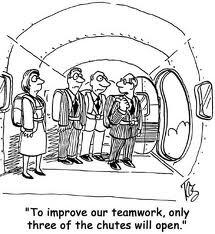 An example of this in a team situation is when a team member says they are on board with the project but is rolling their eyes the whole time. The non-verbal is contrasting the worded message. To overcome: The way you listen, move, and react tells the other team members whether you care, if you are being honest, and if you are actively listening. Your nonverbal signals should match the words you are saying to increase trust, clarity, and bonding. 3. Stereotyping or using only experience/perspective to communicate. Maybe a team member has only had bad experiences with team leaders in the past. As soon as this member is placed on a new team, he immediately stereotypes the new leader and assumes the leader will be a poor leader. To overcome: Talk openly on the team and ask about an issue instead of presuming you know. Create diverse teams to help fade stereotypes. If leaders see prejudices on the team start to form, enhance team training to include education to get rid of prejudices. 4. Cultural or Language barriers. Because of the popularity of virtual teams, many teams are spread out over a diverse region. You may even have teammates that do not speak your primary language. To overcome: Translate all written documents into the primary language of those on the team. This will ensure team members are getting correct information. If needed, hire an interpreter to guide communication between team members. Visuals tend to help break down the barrier as well since most cultures can understand a visual picture easier than words. 5. Not actively listening. Many times in team settings, especially at meetings, we do not actively listen to the person who is speaking. We are already thinking ahead to what we want to say next. We may have strong emotions that are interfering with our listening, or there may just be too much information to take in. To overcome: Active listening means being mentally engaged in the listening process and letting the other person know they are. Try to put your own thoughts aside and make a conscious effort to really listen. Be patient and open-minded while you listen. Training team members to effectively listen will increase overall team confidence and bonding. 6. Unclear goals and misunderstandings. Each team has certain goals they want to achieve. When those goals are not presented clearly by team leaders, or the individual roles and responsibilities of each team member is unclear, then the team cannot work successfully. Team members do not know what job they are supposed to be doing and roles on the team get distorted. To overcome: Simply stating the goals when the team first starts is not enough. Teams need consistent, timely reviews of the goals for the entire team and individual goals as well. When the goals are clearly set, there is less confusion because team members know what is expected of them. 7. Physical separation among team members. When team members work in different geographic locations or even in different parts of the building, communication misunderstandings tend to increase. This most often occurs in virtual teams who are in different locations. To overcome: Team leaders should encourage awareness of communication barriers and confusion. Also, having set policies that include how written word will be sent or that responsibilities are clearly understood by all. By outlining what is expected, teams will spend less time dealing with mix-ups. 8. A lack of trust. Sometimes a lack of trust for other team members is at the center of a team’s communication issues. When teammates do not trust one another, they are less likely to openly communicate and share ideas. To overcome: Focus on team-building events. Members of trusting teams will start to appreciate each other and tap into one another’s skill and experiences. Whether you host a weekend retreat or just take the team out for a drink, communication will improve when teams become closer and trust one another. 9. Distractions. One of the key reasons for miscommunication is distractions. Whether it is an external barrier such as loud noises and other team members talking, or internal barriers such as distracted thoughts, as distractions rise, so does a lack of clarity. To overcome: Eliminating distractions take skill and focus. Sometimes it just means moving to a more quiet location. Sometimes it may mean making a conscious effort to mindfully listen. 10. Lack of accountability. This barrier is frustrating to both team leaders and team members. In the end, the leader is accountable for the team’s productivity. Yet too many leaders only delegate responsibility (task-focused) without accountability (results-focused). To overcome: The fastest way to overcome this barricade is to clarify publicly exactly what the team needs to achieve, which roles will deliver those goals, and how everyone must behave in order to succeed. Do not delegate responsibilities and then abandon your team. Follow-up with members at the right times.